– With limitation of maximum top 100 ShoutCast stations listed in each genre. – With maximum 500 ShoutCast stations listed in each genre (actual limitation from ShoutCast). MinimalSee has lite version and full version, which are completely identical except the limitation of maximum 100 ShoutCast stations listed in each genre and banner Ad in lite version. MinimalSee runs on Apple iOS only at moment. Android version is in under investigation. MinimalSee requires very little audio rendering delay due to the nature of the App. Google Android system has very bad audio delay, which is well known in pro-audio industry. The design criteria of UI model is: make it simple. User is not going to do complex task using Sound UI model. But let’s not to make simple task be complicated as GUI. Often when I’m driving, I just want to switch a net radio station. Why do I have to look at screen to find next station? Why not just swipe it with appropriate audio cue feedback? The design is to virtualize everything into “auditory space” just like icon in GUI on screen. Human ears have ability to recognize the object via sound perception. It’s matter of sound “icon” design to utilize the ability. The model designed here is to assign auditory signature to each object. Object can be App, sound track, audible status,. etc. Let’s say App. Each App has its nature. The nature of music player App is certainly the song in that player; The nature of clock App is ticking sound; The nature of battery level in App is, well, numerical sound. A numerical sound is designed to be short and informative. It may need a little training to get used to it. The basic idea is the number of beep vibrating or simply beeping, with high or low pitch alternatively to indicate the number. The percentage in battery level 0%~100% maps to 0~10. Each object is assigned with audible icon, it is laid out into virtual auditory space. The simplest case is in 1D space. To navigate in this space, use swipe up and down. User would hear to sound feedback with associated object. Swipe left and right, in general, means sub-set selection of different modes or states if exist. If an object is in top level (Home Space) App, user can enter the App via double tap. By saying “enter”, it actually has multiple meanings. It may be “play”, “lock” and “enter” accordingly to different App. Think about it. They are all similar. 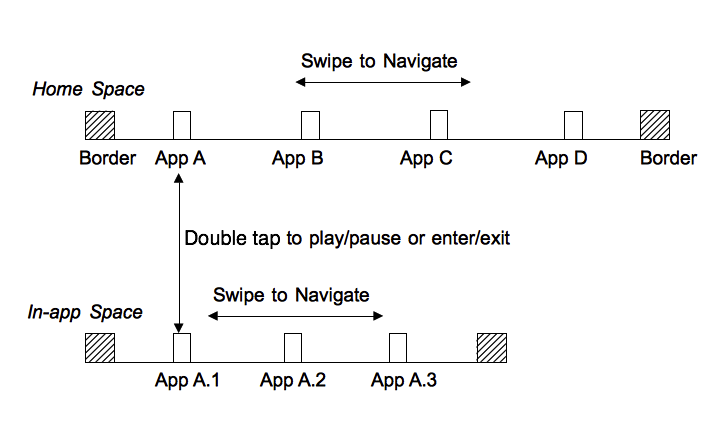 Entering an App also means going into the 2nd level of space (In-App space). The same control methodology is used: swipe up/down, left/right. But this time, it is in-App navigation. In case of music player App, it is sound track selection with up/down and grouping selection with left/right.. The music App supports fast navigation by swipe twice quickly. It navigates itself with much fast speed and slow down till stop gradually. Any single tap would stop the fast navigation. To exit App, double tap again. A sound icon would differentiate enter or exit action. Single tap would trigger a current object feedback. It’s information only. In general, no action taken. Long press is designed to get detail info and fine tuned action. It is non-sticky operation, means it wouldn’t hold the state of diving. It is useful when getting more info of current content using speech or non-speech feedback. There is particular case of long press inside music player: long press following with circular sliding to have fast seek in track, maybe back and forth. MinimalSee contains built-in apps as below. Use swipe up and down to navigate. Some built-in Apps have left and right swipe feature. Such as music player app, it switches the grouping type of songs. In case of internet radio, it switches the genre of radio stations. The visual display is not retained. It fades out if no interaction occurs. This saves battery life as well.